Powers/Abilities: Huckle has no superhuman abilities, but he is a con artist, bartender, bounty hunter, repo man, salesman and agent though he was in no way capable in any of his jobs. (B-Sides#2 (fb) ) - Charley Huckle was best friends with Kane Tucker when they were still children. 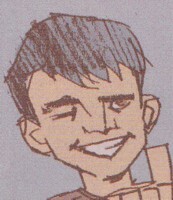 Tucker somehow gained the power to control Darkforce as a child and took down bullies with ease. Charley suggested Tucker should use his powers to become a super hero. (B-Sides#2 (fb) - BTS) - Convinced by Charley Huckle Tucker eventually became the hero Doctor Dark, who was mocked by everyone and eventually ended up as an alcoholic has-been arrested for injuring a man in a barfight. (B-Sides#1 (fb) - BTS) - When he was young and needed the money Charley Huckle came up with the idea to sell a string and two nails for $ 9.95 as a solar-powered clothes dryer. A big expose on 20 Questions was made about this con. Years later Huckle became a bartender at the Rama-Lama Bowling Lanes. (B-Sides#3 (fb) - BTS) - Huckle became a licensed bounty hunter. (B-Sides#1 (fb) - BTS) - Huckle became indebted with a bail bond woman. (B-Sides#2 (fb) - BTS) - Huckle started working as a repo man. (B-Sides#3 (fb) - BTS) - Huckle became indebted to reporter Joel Stuckmeier and/or Anton, a cameraman. (B-Sides#2 (fb) - BTS) - Huckle became a participant at the Raven's Perch Institute for Sleep Research and never finished filled out his personal information. He constantly had nightmare, waking up the others. While he kept working at the Rama-Lama Bowling Lanes he also sold Time Life books by phone during the day. Blaming Huckle for his crappy life Doctor Dark returned to Raven's Perch. (B-Sides#1 (fb) - BTS) - Seeing an opportunity to make money with a super hero franchise in his hometown Raven's Perch Huckle sent out invitations via mail and e-mail to local superhumans Fateball, Jughandle and Mize to meet with him at the Rama-Lama Bowling Lanes to discuss the formation of a local super hero team. (B-Sides#1) - Huckle worked behind the bar at the bowling alley Huckle explained the B-Sides name to the future team (B-Sides as on vinyl records). He than had a drink with the young superhumans to discuss the formation of the team with them, handing out portfolios to them. Enthusiastically he explained that the B-Sides would be Raven's Perch bit super hero team and that they would make a fortune with it. Jughandle recognized Huckle as the guy conning people into buying two nails and a string for $ 9.95 as a solar-powered clothes dryer. Huckle defended his actions by telling the young superhumans that he was young and needed the money back then. They made fun of him and went into a loop outside of the timestream opened by Jughandle. Huckle hoped they would return. To Huckle's surprise they did not only return, but also agreed to join the B-Sides. Huckle immediately planned to call an acquaintance of his, who was posting bail bonds on superhumans to get them their first case, though he warned the B-Sides that he was owing the woman money and that the money they made would be put toward his debt until it was paid off. (B-Sides#2 (fb) - BTS) - Huckle bought a desolate building in one of the worst parts of Raven's Perch to turn it into the B-Sides' future HQ the Jukebox. 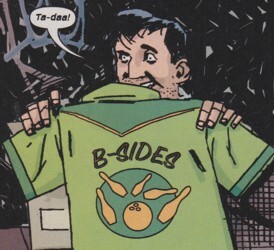 He also got bowling shirts, sponsored by the Rama-Lama Bowling Lanes, as costumes for the B-Sides. (B-Sides#2) - After waking up everyone else after another nightmare Huckle was approached the next morning by one of the researchers, who heckled him about the messages left on their voice mail, reminding Huckle that study participants were not allowed to receive personal calls. Huckle told her these were not personal, but business calls. She then told Huckle that he had still not finished filling out his personal information and that she needed his address to send out tax information. Huckle took the papers to "save her the postage". When the B-Sides arrived late Huckle told them he had to get to work, telling them about his job as Time Life books salesman. Huckle then showed them the desolate building that would become their HQ. Asked why he didn't live there he told the B-Sides that he had already a place to sleep and that the building only had three apartments anyway. He handed out the bowling shirts meant as costumes for the B-Sides, then told them about their first bail bond case: Doctor Dark. He got angry when they didn't take the case seriously and exaggerated that Dark had injured two policemen and put one into a coma during his arrest. When the B-Sides took the case Huckle revealed that he was exaggerating a bit about what Dark had done. When the B-Sides found out that Dark was at the bowling alley Huckle told them to not take him lightly because Dark could be very powerful if he ever found out how he could properly take advantage of his powers. Huckle stayed at the Jukebox while the B-Sides went after Dark at the Rama-Lama Bowling Lanes. (B-Sides#3 (fb) - BTS) - Charley Huckle called the press before the B-Sides went after Doctor Dark. (B-Sides#2 - BTS) - Huckle received a call from the bail bond woman at the Rama-Lama Bowling Lanes while the B-Sides were talking with Doctor Dark. The alley owner approached them to give her message to Huckle. 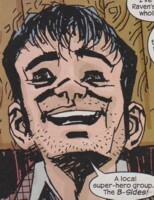 With their connection to Huckle revealed Doctor Dark flipped out and attacked them. (B-Sides#3) - After the local authorities had Doctor Dark arrested Huckle discussed with Mr. Fantastic how much of the bounty on Doctor Dark belonged to the B-Sides, who had tracked down and initiated the apprehension of Dark. Thing ultimately convinced Mr. Fantastic to give the B-Sides the whole bounty after seeing the team were wearing bowling shirts as costumes and obviously needed the money. When the press arrived in form of Joel Stuckmeier and his cameraman Anton they told Huckle they were even. When Joel tried to interview the Thing Huckle pushed Thing out of the way and instead pushed Fateball, who was angry at Huckle because he didn't tell them Dark had been after him, in front of the camera for an interview on the B-Sides aiding the Fantastic Four in the apprehension of Doctor Dark. (B-Sides#3 (fb) - BTS) - Huckle made sure the press reported on the B-Sides aiding the Fantastic Four twice in one day. (B-Sides#3) - Huckle met the B-Sides at the Jukebox after their adventures with the Fantastic Four and was shocked when he learned that Mize had damaged the Fantasticar. (B-Sides#3 - BTS) - The Fantasticar broke down at the Jersey Turnpike due to Mize's actions. (All-New Official Handbook of the Marvel Universe A-Z#2 - B-Sides) - The B-Sides continued their heroic adventures presumably under Huckle's leadership.